Area S-12 is the twelfth course of Rainbow Summit and the eighty-fifth course overall in Mario vs. Donkey Kong: Mini-Land Mayhem!. The Mini Marios all begin along the top, one directly adjacent to the other, with the exit door on the bottom right. In order to reach it, they must simply be guided via a series of Magnet Rods and Blockers to it. The M-Token is located near the middle right, atop a Magnet Block and just above the Mini Mario Card. To collect it, a Mini Mario must stay on top of the Magnet Rod, while placing a Blocker next to it to block the Spike Trap. The Mini Mario Card is located near the middle right, along a Magnet Block and just below the M-Token. 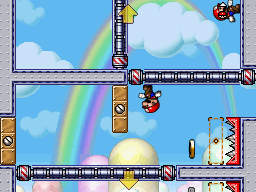 A Mini Mario must use the Magnet Rod to collect it, while placing a Blocker next to it to block the Spike Trap. In order to earn a trophy, the player must score 15700 points. In Plus Mode, the Mini Mario must be guided to the exit door first, followed by the two Mini Peaches.